The story of the Moscow Church of the Brethren is typical of the Shenandoah Valley Dunkers. When our ancestors moved into the Shenandoah Valley, they first clustered around a few communities and developed strong congregations. The early Dunkers were mostly farmers. This was a primary motivation for our expansion in those days. The central congregation of our territory was Beaver Creek. In the early part of the 1800's Brethren farmers began to purchase land and settle in the northwest portion of Augusta County. Beaver Creek recognized the need to provide religious services for the Brethren in this new territory. Meetings were held in homes, schools, and barns. 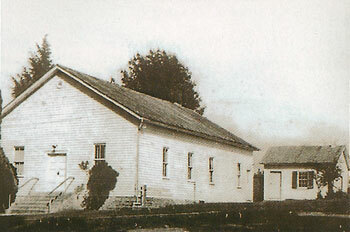 In 1854, the first church was built. It was a wooden frame building near Pudding Spring. This new Church of the Brethren first took the name of Pudding Springs Church of the Brethren. It soon became Moscow Church of the Brethren. The new congregation was quickly tested because the Civil War erupted in 7 years. Following the war, there was a time of rapid growth among the Brethren in this area. The Augusta County Brethren truly captured the missionary spirit of Alexander Mack. Quite a number of new congregations were planted. Moscow was part of this missionary enthusiasm. In 1911 the Griffin Church of the Brethren was build near Deerfield. This was a missionary enterprise of Moscow. Over the years many improvements was made in the little wooden church. Moscow was always basically a congregation of rural people. They ministered to the community and they grew. In the early 1960's, it was obvious that a larger and more adequate church was needed. Plans were made, money was raised, and ground was broken in 1964. The Dedication Service was June 13, 1965. This brings us to the present Moscow Church of the Brethren. The frame building served our ancestors very well for 110 years. Today it is only a memory to those who worshiped in it. The picture above will keep it alive for all of us. In the New Testament, the word brethren describes the kinship of men and women who chose another way of living: the way of Jesus. The Church of the Brethren, begun in 1708 in Germany, still draws people who want to continue Jesus' work of loving service. Today, members in more than 1,000 congregations across the United States carry on the denomination's early tradition of living peacefully and simply and sharing in a vital faith community. For guidance, Brethren look to the Christian scriptures rather than to doctrine. Brethren work locally and worldwide to help victims of war, poverty, and natural disasters.